Nomads Chain of Restaurants offers you and all its loyal customers a chance to save up to 3-10% with our discount cards. What can I do with this discount card? 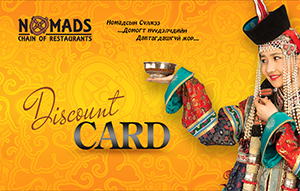 • You can use your discount card at any of our Nomads Chain of Restaurants in Ulaanbaatar, Darkhan, Erdenet, as well as in Selenge and Umnigobi provinces. • For each time you use your discount card, depending on your total charge, the percentage of your discount card can increase. How do I get a Nomads discount card? If you spend over 100,000 tugriks at any of our Nomads Chain of Restaurants, you will automatically be eligible to receive a discount card. If you would like to be an owner of our discount card, you can do so at any of our nearest Nomads Chain of Restaurant. How does my discount card percentage increase?